Restores some dialog options that expand on Somah's background. For some reason Somah's background isn't fully shown in-game. 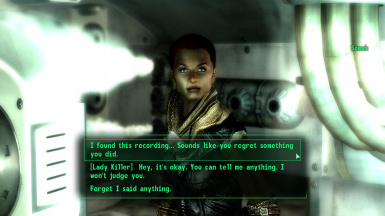 Despite having her captive holotape and possibly the Lady-Killer perk, she won't tell you anything else about herself. After spending a lot of time looking for a solution, the dialog options were simply left out in the link box. I'm guessing this was intentional because aside from the Lady-Killer option, the other two choices have speech checks that lack a SpeechChallengeFailure topic, meaning even if you fail one of them, Somah will still act like you passed it. Enables Somah to talk about her backstory if certain variables have been met. Removes the speech checks, you now need either the holotape, the Lady-Killer perk or a certain attribute to get her to talk. Anyways, heres another fix until we can perfect the Unofficial patch. Enjoy!